We investigate how type 2 diabetes (T2DM) and diabetic retinopathy (DR) affect color vision (CV) and mfERG implicit time (IT), whether CV and IT are correlated, and whether CV and IT abnormality classifications agree. Adams desaturated D-15 color test, mfERG, and fundus photographs were examined in 37 controls, 22 T2DM patients without DR (NoRet group), and 25 T2DM patients with DR (Ret group). Color confusion score (CCS) was calculated. ITs were averaged within the central 7 hexagons (central IT; ≤4.5°) and outside this area (peripheral IT; ≥4.5°). DR was within (DRIN) or outside (DROUT) of the central 7 hexagons. Group differences, percentages of abnormalities, correlations, and agreement were determined. CCS was greater in the NoRet (P = 0.002) and Ret (P < 0.0001) groups than in control group. CCS was abnormal in 3, 41, and 48 % of eyes in the control, NoRet, and Ret groups, respectively. Ret group CV abnormalities were more frequent in DRIN than in DROUT subgroups (71 vs. 18 %, respectively; P < 0.0001). CCS and IT were correlated only in the Ret group, in both retinal zones (P ≤ 0.028). Only in the Ret group did CCS and peripheral IT abnormality classifications agree (72 %; P < 0.05). 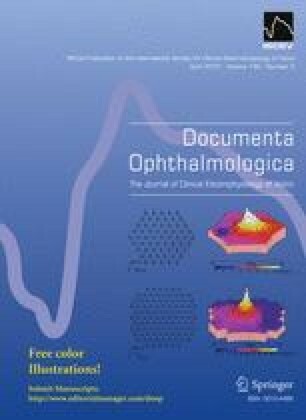 CV is affected in patients with T2DM, even without DR. Central DR increases the likelihood of a CV deficit compared with non-central DR. mfERG IT averaged across central or peripheral retinal locations is less frequently abnormal than CV in the absence of DR, and these two measures are correlated only when DR is present. This study was presented at a conference of the American Academy of Optometry, 2010, San Francisco, California. This research was funded by NIH EY021811 (MES) and NIH EY02271 (AJA). The authors thank Ken Huie for implementing the software for scoring the Adams desaturated D-15 data.